The plan to develop a 221km greenway all the way from Dublin city centre to Shannon harbour and right across County Kildare progressed today. 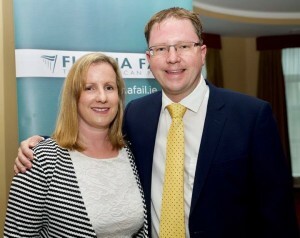 The Chief Executive of Kildare County Council published his report following the submissions process, during which both Deputy Lawless and his colleague Cllr. 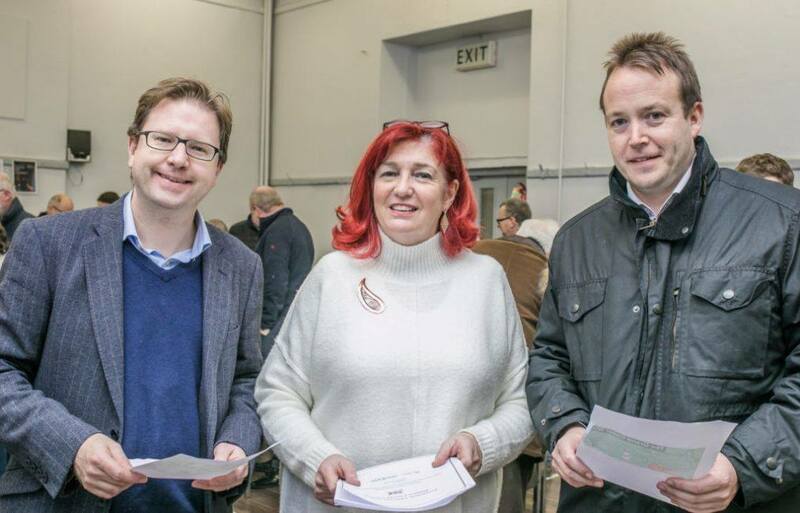 Carmel Kelly had assisted a number of local groups and residents in participating in the consultation. The publication of the report is great news for the entire county, but particularly for all of the towns and villages along the greenway route including Ardclough, Sallins, Naas, Prosperous, Robertstown and beyond. This will compliment the great success of the Royal Canal Greenway through Maynooth, Leixlip and Kilcock in the northern part of Kildare. The boost to tourism, recreation and the local economy that greenway’s such as these bring to an area is significant. Commenting, Deputy Lawless thanked all of the stakeholders for bringing it to this stage and all those who made submissions. He congratulated the council on moving quickly through the planning process and taking on board feedback from local residents. Sallins village – following significant local feedback the route will now not go down Chapel Lane and across the main square. Instead it will more closely follow the path of the canal past Lock13 & Bridgewater. This will enhance pedestrian and cyclist safety while better integrating with local business and hospitality premises. A Village Centre Traffic Management Plan will also be developed to compliment the new routes. 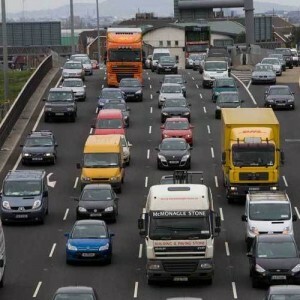 The spike of the route from Sallins into Naas harbour is covered under a separate planning proposal which is at an advanced stage and will go on display in April. This will allow the Naas section to be integrated into the full route. All signage will be bilingual and will also contain heritage information packs. The route will be fully wheelchair and buggy accessible. Marker distance posts will be positioned at 5k intervals along the route. The proposed pedestrian bridge at Sallins will be a high level fixed bridge. The width of the canal will not be reduced at this location and the proposed bridge will have a width and clearance sufficient to permit passage of boats with larger wheel houses. The proposed new swing bridge to the west of Landenstown may be replaced by a mechanically operated lifting bridge (similar to that at Levitstown on the Barrow Navigation) subject to consultation with Waterways Ireland and Canal user groups. The planned route of the new greenway. 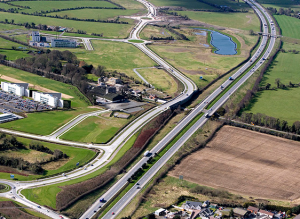 M7 near Millennium Park where Sallins bypass will intersect with new 3-lane motorway. I can confirmed that work has begun in earnest for the widening of the M7 motorway. The works have begun on the M7 at Johnstown to the Naas South exit which will see the motorway expanded and the Sallins bypass installed. The works will fully begin on January 6th. This is a great start to 2018. I have campaigned for many years for the project to go ahead. It is a vital piece of infrastructure which has been badly needed. Now commuters and residents alike will see tangible evidence that the work is well underway. I have been working towards a new second level school for the North Naas area since I first ran for local elections in 2009 and am delighted to now be Chairperson of the Board of that new school as Naas Community College applies for planning on a site at Milennium Park this month. The spec is a brand new build with the highest standards in education, staffing, facilities, technology and catering for not just the growing population of the surrounding areas (including Kill, Sallins, Naas, Rathmore, Kilteel, Eadestown, Caragh, Johnstown) but providing additional ASD unit places also. I look forward to the new build progressing and the move from Craddockstown to the new site.